Having previously tackled religion, climate change, evolution and human nature with his patented Rap Guides, Fringe stalwart Baba Brinkman is no stranger to controversial or intellectual subject matter. In his latest effort, the Fringe First-winner has consciousness on his mind, as he delves into the many unanswered questions surrounding the topic currently dividing the scientific community. Baba Brinkman's Rap Guide to Consciousness is relevant, educational, and a huge amount of fun. Brinkman's infectious enthusiasm about the subject is evident from the outset. Exuberantly explicating the big questions of consciousness in his unique rap form, Brinkman's dazzling lyrical skill is on full display. His flow is effortlessly fluent, chaining double rhymes with startling ease, all the while giving a clear and accessible exposition of the scientific subject matter at hand. In one standout sequence, Brinkman sketches the parallels between the probabilistic thinking of AI and the operations of the human mind, accompanied by an utterly hypnotic animation produced by Google's DeepMind software, which illustrates the disturbingly impressive cognitive capacity of today's technology. Though Brinkman's unorthodox fusion of rap and science is refreshing, and largely successful, some formal flaws niggle. The structure feels spotty, as Brinkman struggles to tie the disparate topics together under the unifying theme the title implies, and his between-song explanations often feel little more than accessory to his impressively lucid lyrics. At times, Rap Guide feels more like a live hip hop album than a fully-fledged theatre piece. Nonetheless, Baba Brinkman's Rap Guide to Consciousness is a consistently enjoyable and easily accessible intro to what, in less accomplished hands, could be a prohibitively esoteric topic. 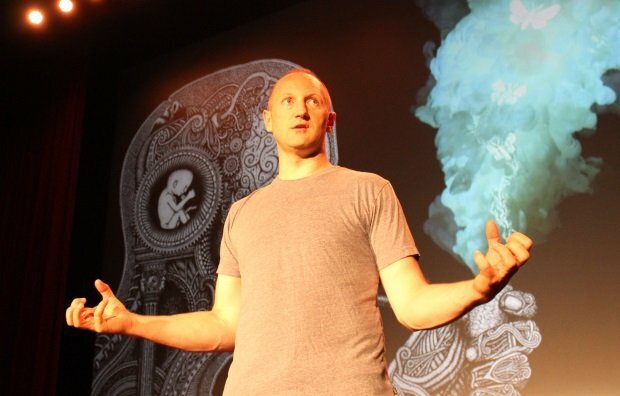 Hip hop heads and science nerds will find equal amounts to enjoy in his latest Fringe success. Assembly George Square Studios, until 28 Aug (not 15), 5.40pm, £9–£10.